If you are looking for information on the Camp Bow Wow franchise business opportunity, Camp Bow Wow dog play franchises or Camp Bow Wow doggie day camp franchising, then you have come to the right place. In the spring of 1994, my husband Bion and I put the finishing touches on a dog business plan that represented our dream of owning a dog franchise together and our wish to create a happier place for dogs to stay for the day or night. The thought of leaving our furry "kids" in a kennel just wouldn't suffice, so we created a plan for a fun and safe Camp version of the traditional dog kennel. Soon after we began our search for the first Camp Bow Wow®location, Bion died tragically in a plane crash. 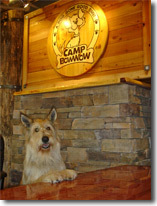 I never gave up on our dream and I eventually opened the first Camp Bow Wow® in 2000. Since then, Camp Bow Wow® has grown into the country's premier dog day care and boarding establishment with over 90 current locations and another 115 Camps under development in the U.S. and Canada. While maintaining a mom-and-pop feel, we have advanced and standardized our concept into the most sophisticated doggy day care and overnight operation in the country. Utilizing technology, state-of-the-art facility design, and intensive employee training, Camp Bow Wows® are operationally the best run and safest environments for dogs to play, romp, and receive lots of love and attention. Camp Bow Wow® and Home Buddies offer many significant competitive advantages over traditional kennels and large corporations. As you learn more about our system of franchising, we hope you will agree that Camp Bow Wow® is simply THE best place for pets and you! 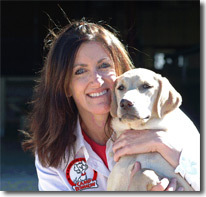 -- Heidi Flammang, Top Dog & Founder. Commitment to Building the Brand - Having operated nationally for over five years, Camp Bow Wow® enjoys the widest brand recognition of any dog daycare and boarding franchise in North America. Even so, we continue to devote significant resources to making our brand the foremost in the industry, while earning our rightful position as a house-hold name. As a member of the Camp Bow Wow® family, you will share in this name recognition and benefit from our pack of loyal customers patiently waiting for a Camp to open in their neighborhood! Education and Training - Unlike other business opportunities, becoming a Camp Bow Wow® franchisee provides you with the most comprehensive and applicable training program available in the dog care industry. You will gain immediate knowledge on how to operate your Camp efficiently, as well as learn the emerging science of dog behavior, group play dynamics, sanitation, pet first aid and safety. Joining Camp Bow Wow® will dramatically reduce your investment risk and put you on the right path to success! Operational Support - Our turn-key franchising program does not end when you open your doors for business. When you join our pack, you become our most important asset and we are committed to providing you with the marketing, training, operations and systems support necessary to help you succeed. Whether you are our most profitable Camp or are a Camp in need of some help, our goal is to work with you to proactively identify areas to improve, innovate and become better than ever. Dedication to Safety and Quality of Service - Camp Bow Wow® was founded to improve the lives of dogs everywhere by promoting good health and socialization. So naturally, everything we strive to accomplish is centered around this goal. Our most fundamental principles and procedures are based upon the highest levels of dog safety and customer service, thereby raising the standards of an entire industry. You only have to look to our competition or your nearest dog boarding facility to see our impact. Our customers recognize our commitment to excellence and take comfort in knowing that this commitment is present in every Camp Bow Wow® from coast to coast. For this reason, we are heads and tails above the rest and THE leader of the pack! Leveraged Buying Power - One of the most dramatic benefits of becoming a Camp Bow Wow® franchisee is the impact to your bottom line. Because we are the largest and most successful dog day care and boarding franchise, we can purchase in bulk the products and supplies you need to open and operate your Camp. This translates into significant discounts on everything from cabins to cleaners to retail products. The list is endless and so are the savings!